Brick Bank Is On The Money! 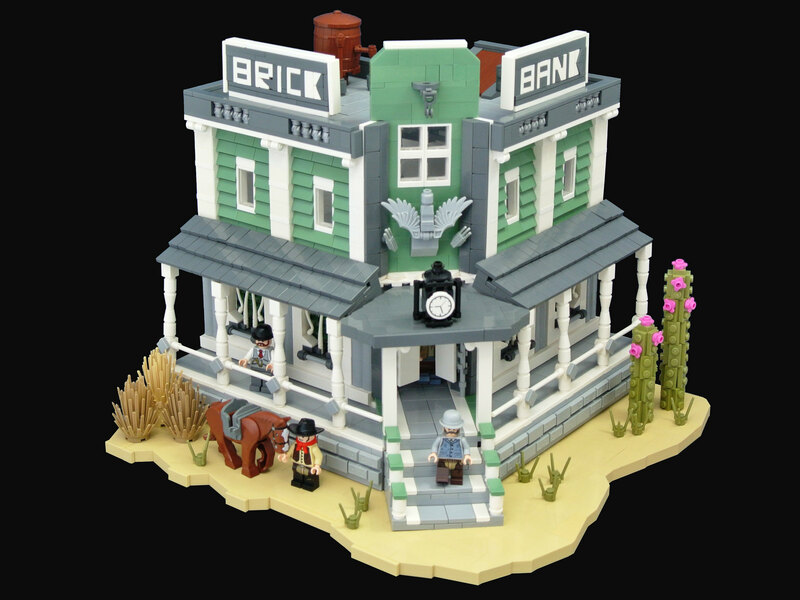 As a huge fan of the wild west as a setting and LEGO theme I was delighted to find the "Brick Bank" by builder Paul Trach. 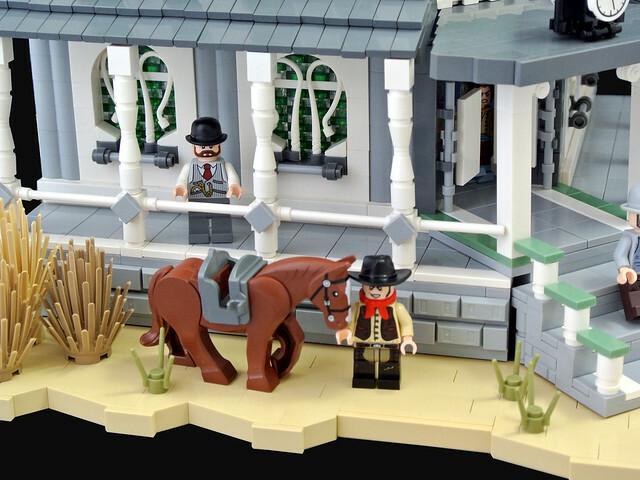 It looks as though Paul has decided to upgrade the Creator set 10251 and repurpose it for the Wild West Theme. Paul explains he has built this for a competition over at his LUG Rogue Bricks. I've seen some other really strong entries already and the Lug seems full of great builders, but this is so far the standout for me! The builder has gone to great lengths to ensure a level of quality that runs all the way through the MOC from top to bottom. The roof has a super water barrel and that funky little winch (was it used to install a small safe in the managers office upstairs?) and the brick built signs show a dedication to doing things right - no easy way out with a sticker here! Did I mention the use of the flat silver ice cream tops for the railings - tekkers! Let's also take a moment to admire the 45 degree angle of the build itself. There is some serious SNOT work going on here and I love it. The façade of the building has some fine decorative adornments and a delicate clock (don't be late to deposit your money). Possibly my favourite detail on the build is the way in which the lattice work on the windows has been crafted using whips, these are highlighted by contrast to the trans green stained glass window panes constructed behind it. As if those details aren't enough Paul has thrown in some authentic looking swing doors, a beautiful pair of flowering cacti, fantastic use of the light grey ingots on the snot work base of the building and a delightful selection of dapper looking minifigs. Paul's stream is full of great builds in a variety of themes - head over and take a look!